The Little 500 happens this weekend. For those of you not lucky enough to have attended Indiana University, the Little 500 is an intramural relay race on fixed gear bicycles on a cinder track and was made famous by the 1979 film Breaking Away, which won the Academy Award for Best Screenplay (1980). In honor of the hallowed event, I've decided to run some analysis of the winning times. Have the times been getting better? 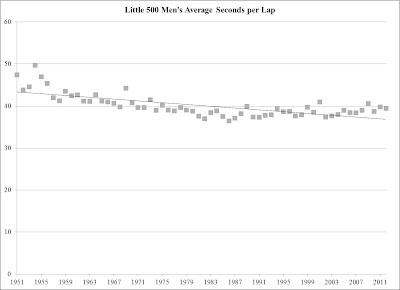 I convert the winning times into the average minutes per lap as to be able to compare the men's times (200 laps) to the women's (100 laps). Inspired by this, I suspected that the women's times might be converging with the men's, but that's not the the case. The women's times have been changing randomly over time. 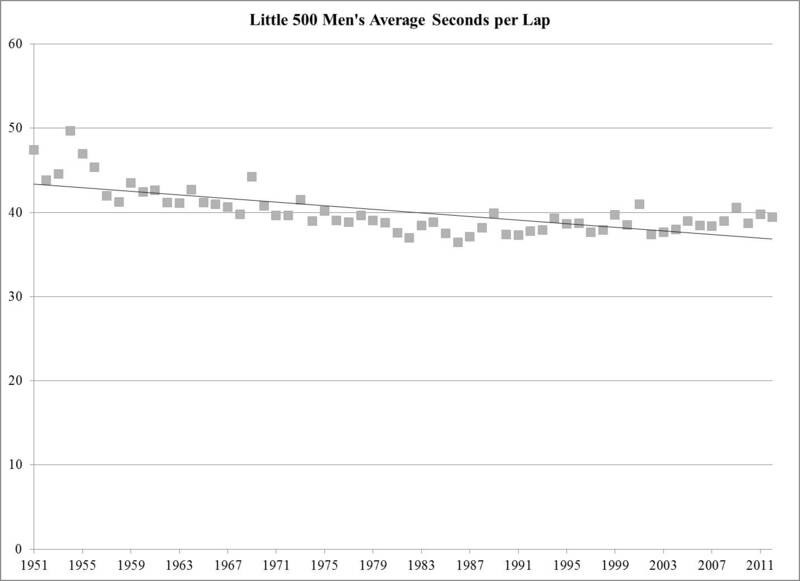 The men's times, however, have been decreasing significantly (p<0.001). Based on this model, the predicted winning time for the 2013 men's race is 2:02:32.6 (36.763 seconds per lap), which would be the second fasted time ever. (The fastest finishing time belongs to the Cutters of 1986 at 2:01:26.4.) (By the year 2360, the race will be over before it starts!) Of course, the Little 500, much like a criterium, is more about strategy and tactics than it is about riding as fast as possible for the entire event. The pace varies considerably over the race. Still, this is what I do for fun.